Technique: Wide field intensified cameras. Example video from the 2001 Leonid MAC mission (no grating). Scientific objective: To measure the total radiative output of the SRC during entry in the 400 - 900 nm band. Instrument: Four cameras, two on both sides of the aircraft, consist of a 50 mm f2.8 Nikon lens, an XX1332 image intensifier with large 48 mm photocathode, and a Sony handycam camcorder (recording of video output on Hi-8 tape in NTSC format - 640 x 480 pixels). 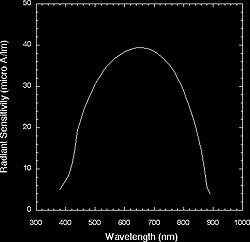 The lens can be equipped with a low-dispersion grating to generate 1st and higher order spectra, each containing a fraction of the light. 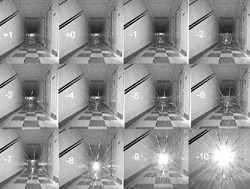 This facilitates the measurement of luminosity when the zero order image saturates. Heritage: These cameras were flown before to record meteors. 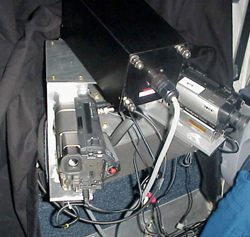 The figure to the right shows the setup during the 2002 Leonid MAC mission, when an ESA camera was mounted on top. In this mission "PHOT" will be mounted on top of the INT1 camera. Aircraft hardware requirements: Fixed mount. Electricity at window. Optional: operation on batteries. Instrument validation tests: These cameras were flown before for near-real time flux measurements of meteor storms. The response of the low-dispersion grating to continuum sources was tested in laboratory conditions. Sensitivity: With a 40 x 30 degree field of view, the star limiting magnitude is about +6.5 magnitude (with Moonlight). Dynamic range: 8-bit (factor 256). Frame rate and exposure times: 30 frames per second, 60 fields (odd, even, interlaced) per second. Exposure time is nearly 1/60s per field. Very low, about 25 nm.